The best way to get to know a community is by scheduling a tour. See the facilities, meet the staff and residents, and get a feel first hand what it's like to live at Pekin Villas of Holly Brook and Reflections Memory Care Assisted Living. At Perkin Villas of Holly Brook you will find a fresh start to retirement and senior living, with numerous amenities and activities to suite every desire. Our community features vibrant independent living and compassionate assisted living services to support an independent lifestyle. The Villas at Holly Brook operates numerous independent living, assisted living and memory care communities across Illinois. Our goal is to create an atmosphere of grace and luxury, where our on-site Executive Directors work to ensure that staff can meet the needs and requests of each and every resident. Residents and visitors alike are greeted by sharply manicured landscaping, welcoming doors and brightly lit common areas. Expect to be wowed with the friendliness of our staff, available to serve your needs, whether in our well-appointed dining area or in our café. At Perkin Villas of Holly Brook, you can choose from a variety of private and semi-private floor plans. Because our community is not just a facility, but rather a home, we encourage you to decorate your apartment to your heart’s content, customizing it to reflect your personality and unique history. Perkin Villas at Holly Brook has compassionate staff available to serve our residents 24/7, regardless of the need. Don’t fret about the home maintenance, as help is just a quick call away. Don’t fear the housekeeping as our helpful staff are there to take care of it. Transportation is available to get you to doctor’s appointments, a local shopping trip with your friends or other group outings. We even have an on-site beauty salon and barber shop, whether you just need a trim and touch-up or want to try out a brand new style. 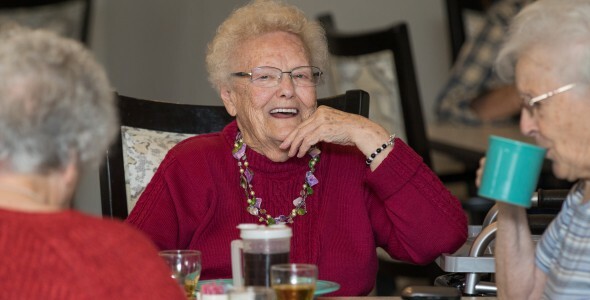 Assisted living residents who need a guiding hand and extra support will be happy to know they can always depend on our caregivers to meet their health needs proactively. At the touch of a button, we are there to respond to emergencies and help with activities of daily living such as bathing, dressing, mobility or toileting. At the same time our memory care staff have been trained with the industry best-practices to private all the care necessary to enjoy a fruitful retirement. We welcome guests, friends and family to join us at Perkin Villas of Holly Brook to see just what you’ve been missing!